U.S. shipments of residential gas storage water heaters for May 2013 increased 1.1 percent, to 367,055 units, up from 363,160 units shipped in May 2012. 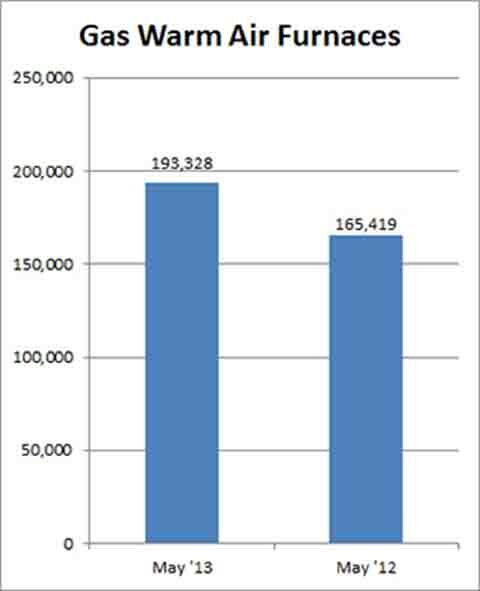 Residential electric storage water heater shipments increased 3.6 percent in May 2013, to 345,077 units, up from 332,974 units shipped in May 2012. For the year-to-date, U.S. shipments of residential gas storage water heaters increased 10.8 percent, to 1,872,506, compared to 1,690,674 units shipped during the same period in 2012. Residential electric storage water heater shipments increased 8.7 percent year-to-date, to 1,744,951 units, compared to 1,605,559 units shipped during the same period in 2012. Commercial gas storage water heater shipments increased 4.5 percent in May 2013, to 7,382 units, up from 7,064 units shipped in May 2012. 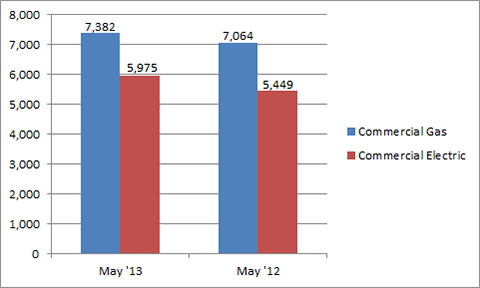 Commercial electric storage water heater shipments increased 9.7 percent in May 2013, to 5,975 units, up from 5,449 units shipped in May 2012. Year-to-date U.S. shipments of commercial gas storage water heaters increased 16.6 percent, to 39,778 units, compared with 34,114 units shipped during the same period in 2012. Year-to-date commercial electric storage water heater shipments increased 5.5 percent to 27,932 units, up from 26,473 units shipped during the same period in 2012. U.S. shipments of gas warm air furnaces for May 2013 increased 16.9 percent, to 193,328 units, up from 165,419 units shipped in May 2012. 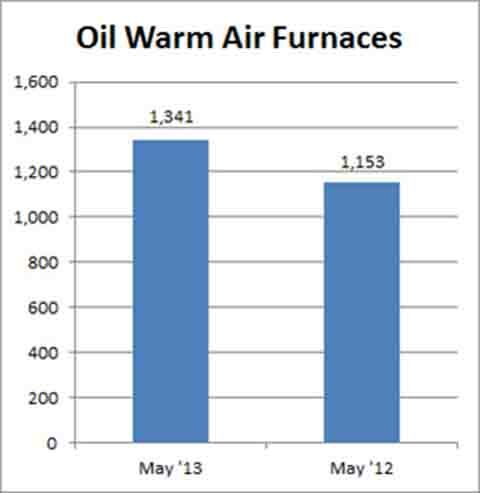 Oil warm air furnace shipments increased 16.3 percent, to 1,341 units in May 2013, up from 1,153 units shipped in May 2012. Year-to-date U.S. shipments of gas warm air furnaces increased 24.5 percent, to 925,001 units, compared with 742,886 units shipped during the same period in 2012. Year-to-date U.S. shipments of oil warm air furnaces decreased 7.6 percent to 9,773, compared with 10,574 units shipped during the same period in 2012. 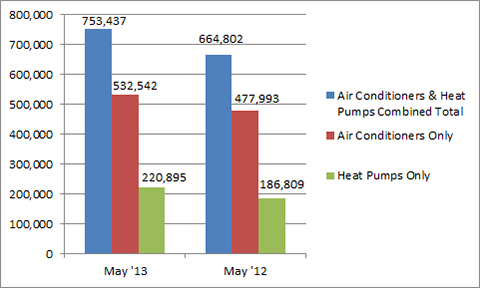 U.S. shipments of central air conditioners and air-source heat pumps totaled 753,437 units in May 2013, up 13.3 percent from 664,802 units shipped in May 2012. 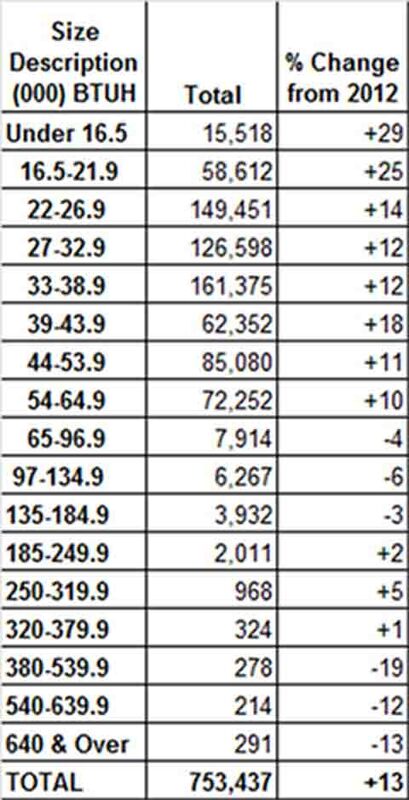 U.S. shipments of air conditioners increased 11.4 percent, to 532,542 units, up from 477,993 units shipped in May 2012. U.S. shipments of air-source heat pumps increased 18.2 percent, to 220,895 units, up from 186,809 units shipped in May 2012. Year-to-date combined shipments of central air conditioners and air-source heat pumps increased 10.4 percent, to 2,614,871 units, up from 2,368,679 units shipped in May 2012. Year-to-date shipments of central air conditioners increased 7.7 percent, to 1,748,314 units, up from 1,623,606 units shipped during the same period in 2012. The year-to-date total for heat pump shipments increased 16.3 percent, to 866,557 units, up from 745,073 units shipped during the same period in 2012.